Don't worry about the names for these projects. They are all give different names so I can remember what they do and get them ready for sale. It's much more intelligent than calling the project MBF-23A- 476 !! Who is going to remember this number in 10 year's time !!! This project combines a number of features from three of the projects we have previously designed and sold to Model Railway Hobbyists. Now you can get all these features in one module. The first feature is the power supply. This module connects to your track and you don't have to provide 15v AC or a higher voltage to charge the electrolytics. 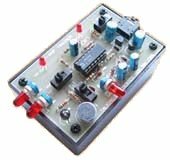 The module has an on-board charging and voltage generating section that accepts almost any voltage and charges the electrolytics to a maximum of 27v. The next feature is the variable voltage (or maximum voltage) for the electro's. You can reduce the voltage to as low as 13v for those solenoid points that do not need a large amount of energy for their activation. The third feature is the reed switch inputs. This allows the module to be used automatically to control a solenoid point so the point gets changed correctly when the train approaches from the other direction. And lastly, the kit comes with a TRACK-PICKOFF connector that fits between the sleepers and connects to the rails with springy connectors. All the work is done with the microcontroller. The charging of the electro's, the timing to activate the solenoid and the detection of the reed switches. 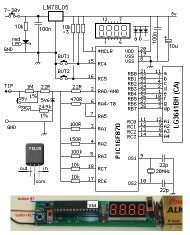 The rail voltage is passed to the project via a bridge and this allows AC DC or DCC to be converted into DC and stored to a small extent in the first 100u. The 100u on the output of the 78L05 provides a small amount of reservoir for the micro and we are assuming the train will be moving most of the time to maintain supply for the micro. The micro drives a BC 338 transistor with short pulses to allow current to flow into (through) the inductor and produce magnetic flux. When the transistor turns OFF, the magnetic field collapses and produces a very high voltage spike. 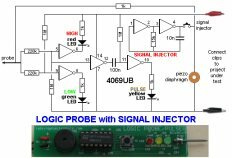 This spike passes through the high-speed 4004 diode and into the 4,700u electros. The spike is really about 50v but the energy in the spike is converted into charging current and the electros would charge to more the 40. But they will explode if the voltage rises above 30v so the voltage on the electros is monitored by the 100k resistor and 10k pot. The PIC micro detects a HIGH when an input is 2.2v and the 10k pot can be adjusted produce a voltage from 13v to 27v. The project takes a very small amount of energy from the track during the charging process and this will not be noticed when powering a train around the layout. 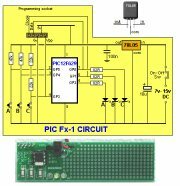 The indicator LEDs on pins 2 and 5 are output devices as GP2 and GP5 are constantly changed from input to output lines. They normally illuminate one of the LEDs, but every 100mS, the program converts the lines to input to detect if a reed switch has been activated. When they are input lines, we want them to have 0v on them and the 10k resistors across the LEDs provide this feature. 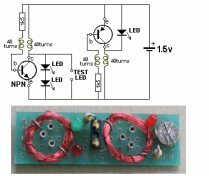 Without the 10k resistors, the impedance of the LEDs is very high and the input lines can "float" and if a white LED is used as an indicator, this "float" voltage can be as high as 3.3v. 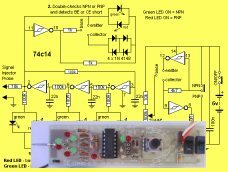 The micro sees any voltage above 2.2v as a HIGH and the circuit would not work correctly. If a reed switch is activated, the line will be HIGH and the program will respond accordingly. Soldering these kits is very simple for me as I build them 10 at a time and have a very good soldering iron and 0.5mm solder THAT IS NOT CHINESE SOLDER. Do not use Chinese solder as it does not contain the correct percentage of tin and lead and it does not "run" or melt or flow properly and does not produce a shiny joint. I can't use Chinese solder so you will definitely not be able to use it. The first things you add to the board are the 13 surface mount resistors. Add a small amount of solder to one land for each resistor and pick them up with tweezers with the numbers showing and solder one end with the solder that is already on the land. Then go around and solder the other ends by adding a small amount of solder to each resistor. The rest of the components are through-hole and it does not matter if you start at one end of the board or with the small components first. Every component is identified on the board and most of the parts have to be fitted around the correct way - so look at the legend on the board. The LEDs must be soldered very quickly otherwise they will be damaged. The mark of a well-designed PCB is being able to put it together with a handful of parts and no other reference. And the mark of a well-designed circuit is 100% operation with every board. You cannot afford to be messing around, "adjusting" the component values and trying to work out why it does not work. That's why every value has a reason and a purpose. This can only be gained by working on hundreds of circuits and gaining the experience, knowledge and understanding. The circuits are provided with all the projects to give you this experience. And to help you fix something, if it "blows up." The photo's show the complete module. The electro's will be bent over and laying flat above the top of the board, on modules pre-built and posted through the mail as they are too tall for the post-box. 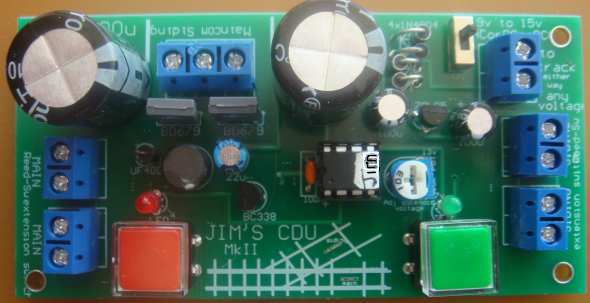 1 - PIC12F629 micro with "JimCDU"
This is a very interesting project to convert a solenoid operated point into semi-automatic operation by adding the two reed switches that all the train to set the point correctly when entering the point from the opposite direction. The module shows the position of the point and it's very easy to set-up with the Power Connector and extension switches.